Everything you need to know about sending wedding thank you notes. Sending wedding thank you notes can be quite a daunting task to tackle and proper etiquette says that it should be done in a timely manner. It's not only polite but also an important way to express your gratitude to each person who made an impact on your day, no matter how large or small. From the moment you announced your engagement through the wedding and honeymoon, you'll likely receive many tokens of love and support from those closest to you during this exciting time in your life. There are also plenty of people you should thank even if they didn't give you a physical gift, from the family members who throw you an ​engagement party to your bridal shower hostesses. The list of people you have to thank is long (and likely growing) so how do you keep up with it and make sure everyone gets a proper thank you? If you break it down, take it one step at a time, and write thank you's as soon as you receive a gift or some help for the wedding, it will all get done quicker than you think. First things first, you'll want to make sure that you have all of the mailing addresses of the people you need to thank. 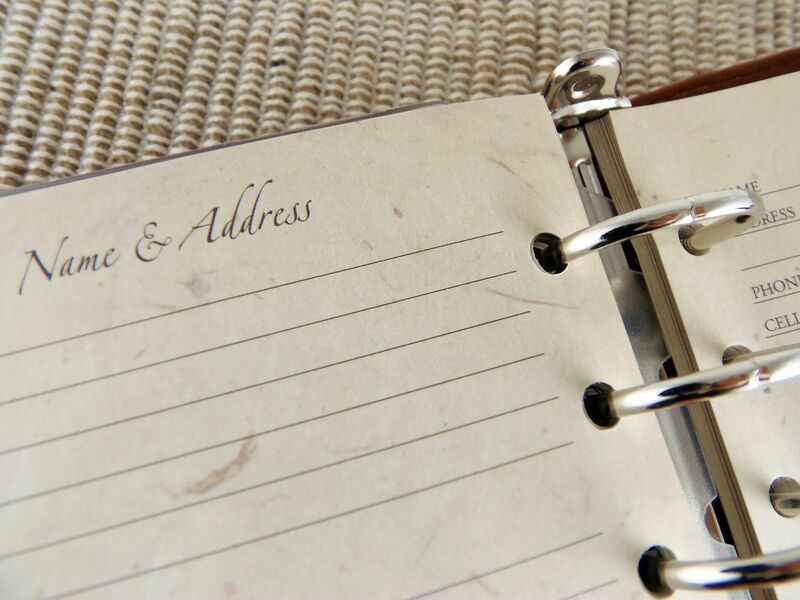 In today's digital age, you may not have a physical address book, so you'll likely have to do some work to gather all of your loved ones' current addresses. Start by referring to your wedding invitation list. This should eliminate a large portion of your thank you list. Be sure to scan it for names of anyone who may have moved recently, then contact them for their new address. There are a variety of ways you can handle your list of addresses. Some people prefer using a spreadsheet on their computer, for instance. Often, the information you gather there can quickly be exported to print mailing labels. Then again, you might like to build a handwritten list on paper, and that's perfectly fine if it keeps you organized. Another simple and free way to collect addresses is with a service like Postable. The company's online address book allows you to simply and efficiently collect and store everyone's addresses in one place. After creating an account, you'll be given a Postable link, which you can then send to all your friends and family, instructing them to fill in their mailing address. The next task you'll need to tackle is making a list of all the people you need to thank and why. This can start from the beginning of your engagement all the way through the honeymoon and post-wedding. You should send a thank you note to each person who attends your wedding celebrations or sends a gift in their absence, as well as anyone who helps you out along the way. You certainly can't send a thank you note if you don't have stationery on hand! There are many great sources online and in stores for thank you notes, you just have to decide which style to use. You can order personalized stationery on which to write your thank you notes, or you pick up a box of generic thank you cards from a local store. There's no right or wrong when it comes to your thank you note design style, just choose whatever you like. The important part is that the notes get sent! Some couples also prefer to wait until after the wedding to send customized thank you cards featuring photos from the big day. If that's the case, then you'll likely be putting off all your thank you note writing until after the honeymoon, but it does add for a nice, personalized touch. Choose your favorites and order them in the appropriate quantity to meet your needs. Having stationery on hand is at least half the battle, so make sure you're prepared! If you're having trouble deciding how to write your wedding thank you notes, you'll find that writing from the heart is best. You can also explore thank you note wording examples to get ideas for the best phrasing for every recipient's note. You'll definitely want to make each note personal. Address the recipients by name and share a specific thank you for whatever gift they gave you, whether it was something they purchased or just the gift of their time and energy to help you with some aspect of planning. You might be wondering when is the appropriate length of time to send a thank you note, or simply "how late is too late?" It's a widespread rule of thumb that couples have at least a year after their big day to send their wedding thank you notes. However, some etiquette advice says that sending a thank you note later than three months post-wedding is simply inexcusable. In general, it is best to send your thank-you notes in a timely manner, ideally as soon as possible after you receive the gift. Sending your thanks promptly gives the gift-giver more immediate appreciation for their thoughtfulness. Plus, it simply gets one more thing on your to-do list done! Whatever system you use to keep track of addresses should also include a way to mark thank you notes that have been sent out. This will help you keep track of who still needs to be thanked so you don't miss anyone. For instance, if you use a spreadsheet, add a column labeled "Gifts" and one labeled "Thank You Notes." When you receive a gift, note what that is next to the person's name, then mark the thank you column with an X when you send off the note. You can also change the color of a row to indicate status. Additionally, address book programs, such as Postable, offer ways to export your addresses to a spreadsheet. Try to write your thank you notes as you receive the gifts to avoid becoming overwhelmed. You'll likely start receiving gifts long before the wedding, so don't put off saying thanks until after the big day is over. Staying on top of this task will only take a few minutes each week rather than having to spend hours writing thank you's in bulk. Your hand might be cramping already just thinking about how many thank you notes you'll have to write. However, there are ways to make it as painless as possible. Make it a date: Set aside an evening to divvy up the list of thank you notes to write and split the task between yourself and your new (or soon-to-be) spouse. It's much less work if there are two people helping! Break it up: Don't try to write hundreds of thank you notes in one sitting. Instead, break up your thank you notes into groups of ten or so and do a group each night until you're finished. Hand cramps avoided! Make it fun: Put on your favorite music or TV show to have some good background noise, and reward yourself with a glass of wine or maybe some chocolate. Hire it out: Consider using Postable to write and send your thank you notes for you. You can type in a custom message for each note, and Postable prints all the cards with realistic-looking handwriting and they even mail them for you. It's super efficient.